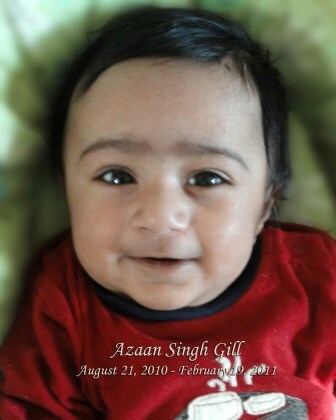 On February 19th, 2011, our son Azaan Singh Gill lost his life to Sudden Infant Death Syndrome (SIDS) when he was taking his afternoon nap. Although all the preventative safety measures were taken, SIDS still took his life. Victims of SIDS are usually found in the crib, beds or sometimes in car seats after going to sleep without any struggle or suffering. Children between 0-24 months of age are most susceptible to being affected by SIDS. The body simply stops, the heart and brain shut off like a light switch. There is no answer to why this happens. Therefore, we are donating all the funds to the Pathology Research Clinic here at BC Children’s Hospital to help find a cure. Let’s come together as a community and let’s make a difference so this tragedy doesn’t happen to any other family. We are holding an event to create awareness and raise funds for a cure. Register for the event or make a donation. We would like you to join us and support this great cause! Thank you to everyone in advance – we are so grateful for the support in helping us create awareness and raising funds to cure for SIDS. 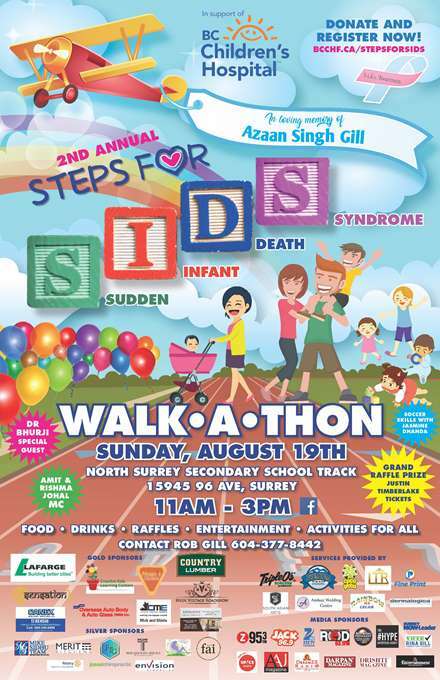 In 2017, Steps for SIDS raised $17,789 at the inaugural event! Let's raise $20,000 this year! On behalf of all of us and BC Children's Hospital, thank you again for your generosity and for caring for our children and their future.